If you like Buffalo chicken, make this dish. Make it now. Make it, and revel in how quickly it comes together. 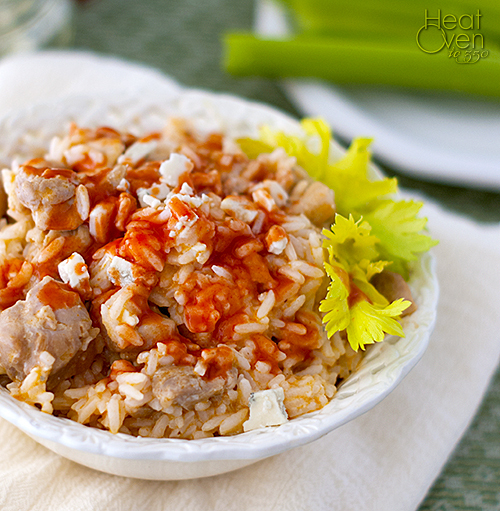 Make it and enjoy every saucy bite of juicy chicken, blue cheese, hot sauce and rice. Make it and wonder how you never thought to make something like this before. Make it and easily eat two servings in one sitting, and then sneak back over to the pan and steal some more. Make it today and then make it again tomorrow. If you do all this, you will be doing exactly what I did when I found this recipe. Bring a large pot of salted water to a boil over high heat. Add the rice and cook for 15 to 17 minutes, or until it is tender. Drain the rice in a strainer, reserving 1 cup of the cooking liquid. Meanwhile, cut the chicken into ½ inch cubes. Melt the butter in a large skillet over medium heat. Add the chicken and a pinch of salt and cook, stirring occasionally, for 3 to 5 minutes, or until just cooked through. Remove the chicken from the heat, toss with the hot sauce, and set aside in the skillet. Crumble the blue cheese (about 1/4 cup). Once the rice has cooked, stir it into the chicken in the skillet along with the reserved 1 cup cooking liquid and the blue cheese. 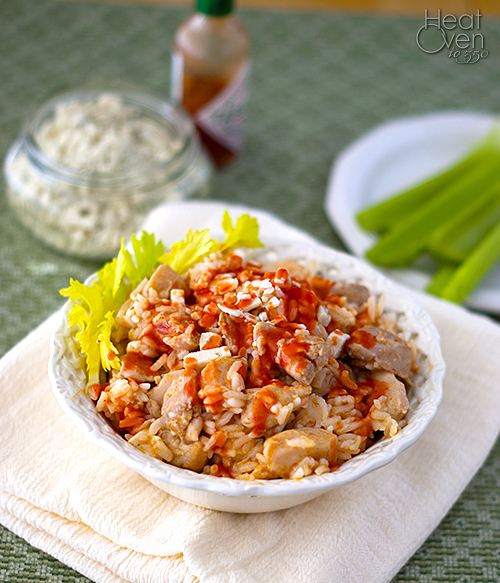 Divide the chicken and rice among 4 serving plates and top with the celery leaves, if using. Drizzle with additional hot sauce and top with more blue cheese if desired. This sounds like heaven to me! I love buffalo anything, and added to rice sounds awesome! FRANKKKKKSSSS. i crave, crave, crave Franks. it is simply the best. i've been scaling down on processed foods and condiments but Franks is something i refuse to let go of. it's delicious on basically everything! my boyfriend mixes it in with quinoa and tofu for a similar take on this dish. It really is the best, isn't it? I found it almost by accident because my regular hot sauce was out of stock and I've never looked back. Ooo, super yum! My husband would love this! I didn't understand either, until I made the recipe. It just thins it out a bit. The cheese tends tom make it thick. You can always leave it out if you prefer the texture before adding the water. Starch water is a great way to create a sauce in a recipe that doesn't have much liquid. You can do the same with pasta water if you want to make a pasta sauce/coating from just parmesan cheese- it keeps it from being too dry. Thanks for the info, Amy! I love learning cooking tips. Wow what a terrific recipe. It looks so delicious. Very creative.